This book includes four hitherto unpublished papers together with a substantial introductory historiographical and bibliographical overview. Many of the studies concern the liturgical views of figures like Lanfranc, St Hugh of Lincoln, and William of Malmesbury (an edition of William’s Abbreviatio Amalarii is included) and the ways Thomas Becket and the Venerable Bede were viewed liturgically. Others reveal the achievement of an 11th-century Canterbury scribe, lay out a hagiographical puzzle as to the saints venerated on the 19th January, ask why calendars come to be attached to psalters, demonstrate that monks at Canterbury Cathedral were still reading Old English homilies in the 1180s, and present a fascinating, previously misunderstood, psalter owned by bishop Ralph Baldock, c.1300. Two final papers deal with ’Sarum’ services in late medieval parish churches and with the devotional practice called St Gregory’s Trental. Contents: Introduction: the study of medieval liturgy; Eadui Basan: Scriptorum princeps? 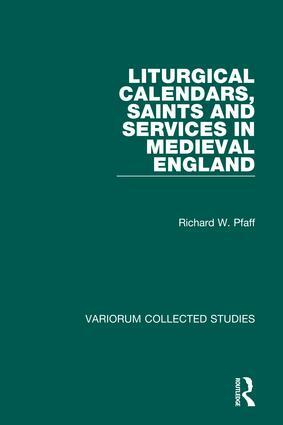 ; Lanfranc’s supposed purge of the Anglo-Saxon calendar; The hagiographical peculiarity of Martha’s companion(s); The Abbreviatio Amalarii of William of Malmesbury; Why do medieval psalters have calendars? ; Some Anglo-Saxon sources for the ’theological windows’ at Canterbury cathedral; Martyrological notices for Thomas Becket; St Hugh as a liturgical person; Bede among the fathers? The evidence from liturgical commemoration; Bishop Baldock’s book, St Paul’s Cathedral, and the use of Sarum; Prescription and reality in the rubrics of Sarum rite service books; The English devotion of St Gregory’s Trental; Index of Manuscripts; General Index.